Opened in June 2014 and situated on the roof of the building, this GroDome has six controlled, contained compartments or 'chambers' which are negatively pressured and therefore conform to ACGM level 2. Each compartment can be controlled separately, offering a total of total of 84 m2 of actual growing bench and/or floor space. Supplementary lighting is installed in the all compartments, using <206W Attis7 LED grow lamps, which uses an external lighting sensor as part of the control system to increase energy efficiency. The temperature control system is maintained and data captured using the Life Science Building's building management system. There are five compartmentalised greenhouses with a total of 114 m2 of actual growing bench and/or floor space. Supplementary lighting is installed in the majority of the compartments. Each lamp consists of a 150W 50/60Hz High output, Correct Spectrum Class 11 energy saving bulbs. All have heating, supplementary lighting, ventilation and shading, which are computer controlled. 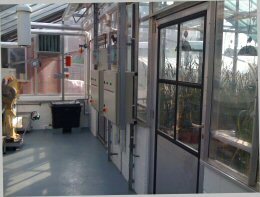 Within the main glasshouse, there are a further 2 compartments and header compartment which have refrigerated cooling, filtered negative air pressure ventilation and treated drainage which conforms to ACGM level 2. An on-site, external meteorological station is connected to the computer controllers and control the lighting and shading. Use of the ridge and side ventilators are also limited by the controllers during windy or wet weather. These greenhouses also has supplementary lighting. Heating and cooling is provided by split system air conditioning units. These greenhouses are unheated and have no supplementary lighting. Ventilation is provided by an automatic ridge vent. There is a limited amount of outside pot standing space, which also has several cold frames for plant hardening off purposes.